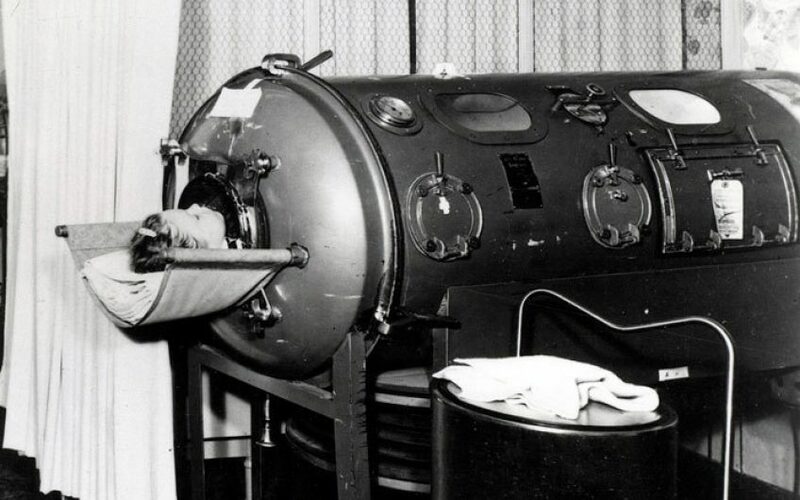 What was The Iron Lung? On 20th April 1959, at the age of twenty, I was admitted to the Kowloon British Military Hospital in Hong Kong with a fever. Later in the day, I found myself fighting for breath, surrounded by figures in masks and gowns, who seemed to be blocking out my air. They were intent on lifting me into a yawning box which, in my delirious state, I mistook for a coffin. Enfeebled though I was, I did all I could to resist them. But I soon gave up the struggle and sank into oblivion. It was not a coffin, of course, but an iron lung. I had never heard of an iron lung and had no idea what was wrong with me. ‘A temporary form of paralysis’ was all the doctor had said. But the iron lung … This was a long cylindrical tube with portholes on either side. My body was encased in it with my head sticking out at one end. Above my head was a glass shelf, on which a book could be placed face-down so that I might read if there was someone to turn the pages. There was also a sort of rear-view mirror in which I could watch the world go by. An iron lung is a ‘negative-pressure ventilator’. It works by alternately pumping air into the cylinder and sucking it out again, causing your chest to rise and fall in sync with it. It doesn’t involve a surgical intervention like a tracheotomy, as positive-pressure ventilators generally do. But it is an uncomfortable – if life-saving – beast. To ensure the cylinder is airtight, your neck has to be padded with cotton wool; and to this day, if anyone puts a hand around my neck, my first impulse is to lash out. I won’t wear polo-necked jumpers, or even a tie if I can avoid it. Once you get used to the rhythmic sucking and blowing of the machine, it can be a comforting sound – like the ebb and flow of waves on the beach. But it was not always thus. Frederick B Snite, a wealthy young American who contracted polio when travelling in China in 1936, described his first iron lung as ‘a threshing machine with a cold’. Yet without it he wouldn’t have survived. He was lucky that one of the original sixteen respirators devised in 1928 by Philip Drinker, an engineer working at the Harvard School of Public Health, had found its way to China, courtesy of the Rockefeller Foundation, and happened to be just minutes away from where he fell ill. He was dependent on iron lungs for the rest of his life but managed to travel, get married and father three daughters, becoming something of a celebrity – second only to Franklin D Roosevelt among polio survivors in the US. The National Foundation for Infantile Paralysis (better known as the March of Dimes), co-founded by FDR and his former legal partner Basil O’Connor in the mid-1930s, came into being at the most opportune moment for the development of iron lungs. FDR’s name and O’Connor’s forceful personality made this the most effective medical charity, certainly of its time and perhaps ever. Faced with a shortage of respirators and an increasing number of respiratory cases in the US polio epidemics of the 1930s, doctors had the invidious task of having to decide whose need was greatest. But logistical problems were meat and drink to O’Connor: he established respirator centres all across the States and for the next twenty years – until first the Salk and then the Sabin vaccines made them redundant – saved many lives as a result. In this country, where respiratory polio cases also mounted during epidemics before and after the Second World War, the main benefactor was the motor manufacturer Lord Nuffield, who used his Morris Cowley works in Oxford to produce iron lungs which he distributed to hospitals in Britain and throughout the empire – including the one I occupied in Hong Kong. Respiratory technology has now moved on and polio epidemics are a thing of the past. As a result iron lungs are, for the most part, museum pieces. By no means all polio cases required iron lungs; and iron lungs were also used for other respiratory ailments. But in people’s minds the two are inextricably connected. A ward with rows and rows of iron lungs is one of the enduring images of polio – which, along with pictures of children with their legs encased in calipers, the March of Dimes did not hesitate to use for fund-raising purposes.